When you go to the home improvement center, it’s usually pretty easy to eyeball the bags of mulch, dirt, stone, and concrete to figure out how many you need for your project. But if you’re working on a larger scale, these materials are sold in cubic yards, which can be more challenging to figure out, not to mention haul home. Whether you’re filling your pickup truck or having a load delivered on a dump truck, here are the answers to some frequently asked questions about working with cubic yards. A cubic yard is a cube of material that is one yard (3′) wide, long, and high. There are 27 cubic feet in one cubic yard. Now, before you get the yardstick to measure the size, keep in mind that loose materials will fluff up significantly if dry and compress down when wet. The weight of a cubic yard depends entirely on the type of material. Mulch: Weighs in at roughly up to 1,000 pounds per cubic yard, depending on the type and whether it’s wet or dry. Soil: Weighs about 2,200 pounds per cubic yard, depending on the moisture content. Sand, Gravel, Stone: Can tip the scales at upwards of 3,000 pounds per cubic yard. Check with your supply yard for weights of specific materials. How many wheelbarrow loads are in a cubic yard? Wheelbarrows come in different sizes, but a medium sized, 3-cubic-foot wheelbarrow, will take about nine loads full to equal one cubic yard of material. The best way to estimate the quantity you’ll need is by plugging the height, width, and length need into our Cubic Yard Calculator. As a general guideline, if you’re spreading the material 3” thick, one cubic yard will cover about 100 square feet, or a 10′ x 10′ area. Can I haul a cubic yard in my pickup truck or trailer? Sure, assuming it doesn’t weigh more than the truck or trailer is rated to handle. Supply yards are usually good at sizing up your vehicle, and loading a safe amount of material. Still, if you’re driving the load yourself, it’s important to understand your vehicle’s hauling capacity, as well as how your vehicle behaves when fully loaded. Trailers can be especially difficult, due to the risk of fishtailing. If you’re pushing the weight limit, stay off major highways and Interstates, and keep your speed under 45 mph. Full-size Pickup Trucks: Can usually handle 2 cubic yards of soil, 2-3 cubic yards of mulch, and 1 cubic yard of stone or gravel. Small Pickups and Trailers: Can usually handle 1 cubic yard of soil to maybe 1½ of mulch. Dump Trucks: If you’re having the material delivered, a small dump truck usually carries about 5 cubic yards, and a larger one carries about 10 cubic yards or more. If you’re new to working with this quantity of material, it’s really easy to get started. During peak seasons, supply can’t always keep up with demand, so start by calling your local supply yards to get prices and availability of the desired material. Landscape supply companies usually carry topsoil, mulch, sand, gravel, and patio stone. 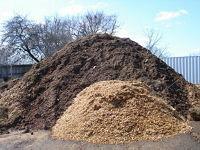 Mulch and compost, made from ground-up yard waste, may also be available at your local landfill for a low price. Concrete needs to be ordered from a concrete delivery company and comes premixed in trucks. If you want the material delivered, you can place your order right then over the phone. If you’re picking it up yourself, you simply need to drive into the supply yard, park at the office or booth, and go inside to place your order and pay. The staff person will then direct you to the loading area, where a front-end loader will come and scoop the material into your truck or trailer. And off you go! What should I do with my materials? Ideally, you should dump the material at the final location – your back will thank you! With my small truck, I just back it right up to the flower bed or driveway, then shovel the material out. If that’s not possible, dump it in a flat spot where you aren’t worried about killing the grass underneath. If you’ve got a really big project, enlist some help and 2-3 wheelbarrows, to keep the job moving along. We recommend contacting your local home center, which has these materials and can tailor recommendations to the project. I am looking for a rule thumb figure here I have a Semi Trailer that is 9′ High x 8-1/2′ Wide by 45′ – 127.5 cu. yrds per load / 178.5 Tons Per Load. Now that is my math I am wondering if that is going to be the same if the load contained ashpalt. Can you send me some information regarding different material for the dimensions of the trailer. For example type II gravel (cubic yards). peat(cubic yards) etc. What kind of driveway is the mulch on? How can I get rid of 8 yards of mulch on my driveway. 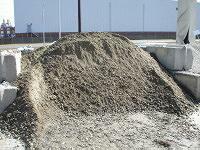 How do I measure a truckload of dirt once it’s delivered in a big pile. To make sure I got enough. I have a question regarding delivering mulch through my driveway. Is it safe for a 10 cubic yard capacity tandem truck to drive on my 4″ driveway to deliver the mulch? @Jessie: As long as moisture content is not an issue (since most yards sell it by the Ton) wet would get you more bang per cubic yard. The only issue is moving it and then spreading it out once you get it where you want it. I would allow as long as you can stand it, and as long as the weather cooperates to allow the dirt to dry out. Break up as much of dirt clods as can. Make sure to use a tamper to compact the dirt if you are going to build up a area (such as a pad) every 4 to 6 inches. I have a question. With weight not an issue, would I get more dirt in a cubic yard if it is wet or if it is dry? I had 12cubic yards delivered to try and fix my back yard. I leveled it all out and then went to compress the dirt. the problem is where the dirt is 2-6 inches deep it works great, then I get to where it is 6-12 inches I sink. I cant get it to compress down. what should I do. None of these weights is anywhere near accurate. Cut the weight in half from what is listed here and you begin to approach common load weights for these materials. This piece is great information for home owners. Very informative!Really like your page, Hard to find articles like this!! Hi, I’m in Danny’s area (Mobile, AL) and have a question about materials and pricing. I am looking for an inexpensive ground cover for a firepit area. It can’t be poured concrete due to the large tree roots in the area, so I’m thinking some kind of gravel. I like the gray gravel in the photo attached to this article — what is the gray gravel called, and is it cheaper than the orange-ish brown pea gravel? Which would be easiest to walk in — the tiny pea gravel or the slightly larger gray gravel? Thanks. It depends on how much the wheelbarrow holds. It would take 7 7/8 cubic feet to fill a 9″ x 9″ x 14′ pillar (0.75′ x 0.75′ x 14′ = 7.875 cubic feet). Large wheelbarrows hold about 6 cubic feet, so it would require a little over 1 large wheelbarrow full. 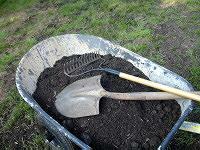 Pls, how many wheelbarrow of earth sand, cement and gravel can fill up 9” by 9” by 14ft piller?